A magistrate court sitting in Abuja has granted bail to Senator Dino Melaye in the sum of 90 million naira and two sureties. 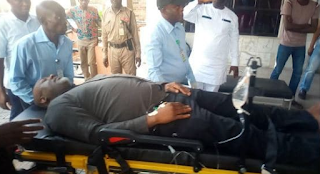 Following the arraignment by the Nigeria police force, the senator appeared in court on a stretcher. PoliticsNGR gathered that journalists were prevented from going into the court premises. Armed policemen have taken over the court as there are rumours of a plot to re-arrest the ailing senator.